Blown Glass Chandelier – Cobalt Amber Clear White Teal Chandelier – Will customize to your dimensions. On site setup and installation is available by the artist. Please note that this listing is for a custom” to be built ” chandelier that will have slight differences from the chandelier shown in the listing photos, and a lead time of aprox 3 weeks. This beautiful hand blown glass chandelier was handmade in our studio. One of our most recent and popular designs, this particular piece was made using clear, white, amber, teal, and cobalt blue colored glass that was blown and ribbed. Each swirl is a separate piece of glass that is fastened onto a handmade frame with the light bulbs in the center. There are 10 individual standard medium base 100 watt light sockets, and includes10 dimmable LED light bulbs that will last for 20,000 hours or longer. It measures aprox 72 inches tall x 48 inches across, and also comes with a custom made matching glass ceiling canopy. We specialize in custom lighting, so this piece can be made any size and in your choice of colors! 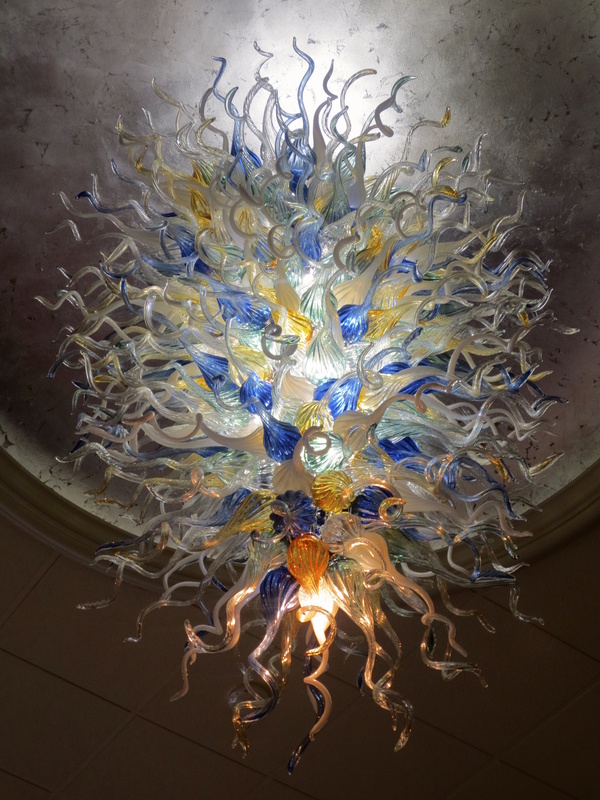 We were recently commissioned to create a chandelier just like this one with over 700 pieces of glass! Imagine the possibilities…. Please contact us with any questions about this item or about doing a custom chandelier for you at 908-670-3722. This is just a sampling of what we can do. Worldwide installation by artist available at additional cost.